Dr. Amir pursued postgraduate trainee in medicine and specialized in Obstetrics & Gynecology. 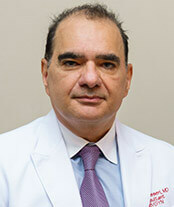 He has also trained many medical students from 1996-2006 and held a position as clinical assistant professor at the University of Arizona, in addition to Academic professor at University of Touro and University medical center in Nevada. He has published book chapters, research articles, and case studies. Dr. Nasseri has held many leading positions in major hospitals and peer review committees and frequently appeared as a leading expert by various medical defense teams. Management of medical complications of pregnancy and high-risk deliveries with specific interests in gestational diabetes, endocrine disorders, and multiple gestations. Woman’s reproductive tract, pregnancy and childbirth.